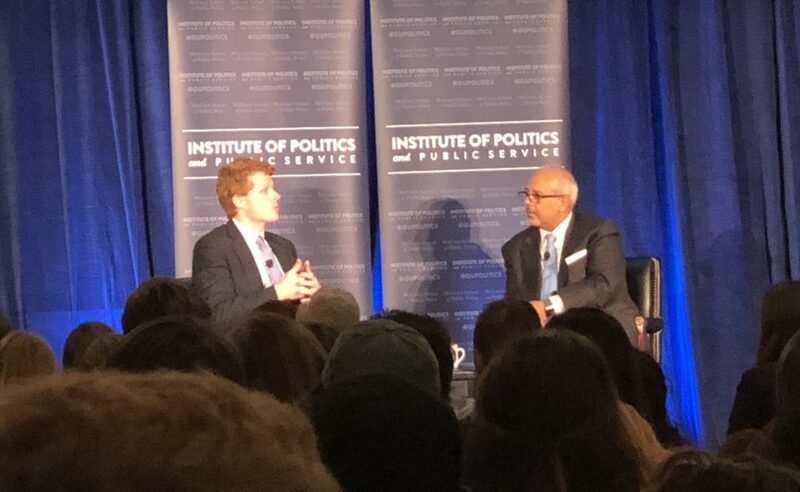 The Institute of Politics and Public Service at Georgetown’s McCourt School hosted Congressman Joe Kennedy III (D-Mass.) on Nov. 13 in the Copley Formal Lounge. 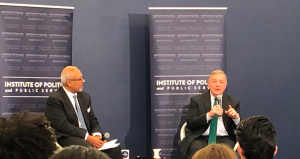 Kennedy was joined by the executive director of GU Politics, Mo Elleithee (SFS ’94), who moderated the discussion, which revolved around last week’s midterm elections, healthcare, and bipartisanship in a divided Congress. Elleithee also asked Kennedy about his speech as the Democratic response to President Trump’s 2018 State of the Union address. In it, Kennedy stated that Democrats fight for both sides, rather than picking one side or the other in terms of caring about people on both sides of the aisle, and not leaving anyone behind due to political polarization. Voters, Kennedy said, were choosing one side or the other, increasing the amount of political polarization. In his speech, Kennedy said that the Democrats would do something different. “So here is the answer Democrats offer tonight: we choose both. We fight for both. Because the strongest, richest, greatest nation in the world shouldn’t leave anyone behind,” said Kennedy, during his response to the State of the Union in January. Kennedy also spoke at length about healthcare, comparing Massachusetts’s healthcare to the rest of the nation. Kennedy believes that Obamacare is the origin point of today’s political polarization, and what caused the major split between parties. One of the reasons for the resistance to Obamacare, Kennedy said, is in the name. “The fascinating thing about healthcare is that, if you take the name ‘Obamacare’ away, polarization actually falls off. More people support it.” Kennedy said. He told a story of a senior Republican Congressman talking to a newly-elected Republican Congressman about healthcare. The senior Republican, according to Kennedy, wanted to move off of a volume-based system and towards a quality-based system of compensation for providers. Nile Bee (COL ’22) asked Kennedy if he thinks passive bipartisanship is working, or whether the Democratic party needs to be more aggressive against Republicans. Kennedy replied that both is fine, but taking the middle way is best. He also highlighted the recent election, with Congress now divided between the Democrats controlling the House of Representatives and the Republicans controlling the Senate. 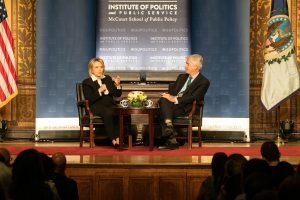 Myles Nuzzi (COL ’21) asked Kennedy about the 2020 elections, how Democrats can reconcile with the prospect of President Trump running for re-election, and who he thinks would make a good Democratic candidate to run against him. “I think there’s a number of great candidates in the Senate that could be interested, as well as some in the House, or with Governors. I think there’s a lot of great candidates,” said Kennedy. He referenced Massachusetts Senator Elizabeth Warren and Texas Congressman Beto O’Rourke by name, while not giving a firm answer if he intended on running for president in 2020. Kennedy told the audience that the biggest challenge he sees for the Democratic party moving forward to the 2020 elections is credibility. Namely, earning people’s trust on a national level similar to the way O’Rourke mobilized support in the Texas senatorial election.